ServiceMaster of the North Shore serving Glencoe, IL 60022 and the surrounding communities in Cook County and Lake County IL since 1975, is available to serve both residential and commercial customers for all carpet cleaning, upholstery cleaning, tile floor cleaning and emergency water damage or fire damage clean up needs. We remain passionate about our business, and are committed to continuing to provide the absolute best quality carpet, upholstery, tile floor, wood floor and general whole house, post construction or business cleaning to our valuable customers. Our highly trained Crew Leaders and technicians will be there in a hurry 24/7/365 if your home or business has suffered water damage, fire or smoke damage, vandalism or needs board up service. It is our ultimate goal to provide quality cleaning and restoration services, utilize clear and consistent communication, and work diligently and with integrity thus, creating peace of mind for all of our clients. Call ServiceMaster DAK, in Glencoe IL, at 847-251-6030 when disaster strikes your home or business and you have water damage or smoke or fire damage. 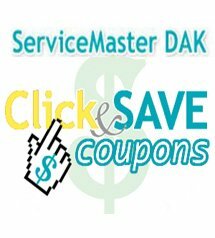 ServiceMaster DAK meets the stringent demands of the ServiceMaster Clean brand and is recognized as a leader in performance, service, and quality. Dean and Eileen Knox, owners have been recognized by the ServiceMaster Corporation for “Service Excellence” receiving the Marion E. Wade award for both Disaster Restoration and Residential Services.